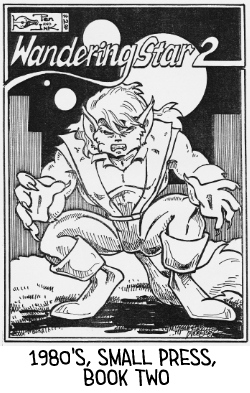 Ever been curious about what those infamous, 1980s, Small Press books looked like? Or maybe you just wanted to take a peek at the notes I made while creating the series? Well, you've come to the right place! 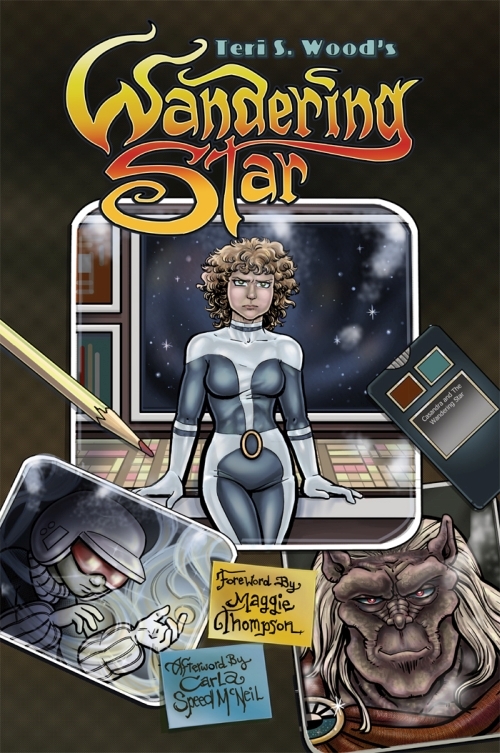 This page was created as a supplement to the Dover Publications, WANDERING STAR Omnibus, coming June 15th, 2016. Here you’ll find all the things that couldn’t make it into the book (Hey, it’s 480 pages -- and a book can only be so big!). There’s a lot of stuff. 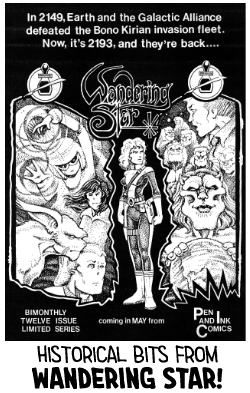 Over the next few months I’ll be adding the second of the Small Press WANDERING STARs from the 1980s -- Small Press, Book One is in the Omnibus! Yay! And a ton of other stuff too! See below for the coolness! And hopefully, in time, a Fan Art page! If you're of a mind to draw up some fan art after reading the Omnibus, and would like to see it featured on my site, please send a digital copy -- 300 dpi, at least 1200 px on one side -- to my email (teriwood at teriwood dot com), with your name, website (if you have one), etc., and I'll get it up as soon as I can. But please remember, this section is going to be a Work In Progress for a bit, as I find more things to add to it. Right now, it's January 2016. And I wouldn't be surprised if I am still adding links to new stuff when June 2016 rolls around. What that means is some of the links won’t work yet. And new links may be added later. Whoo Hoo! And, away we go!